Up to 8x faster than standard mice - near-instantaneous response , 200-8,000 DPI sensor delivers on-point accuracy , DPI shifting lets you switch between 4 sensitivity settings , Six programmable buttons with onboard memory let you store custom commands for your favorite games , Choose from a palette of up to 16.8 million colors for a vividly beautiful experience , Lightweight and ergonomically designed for your comfort. 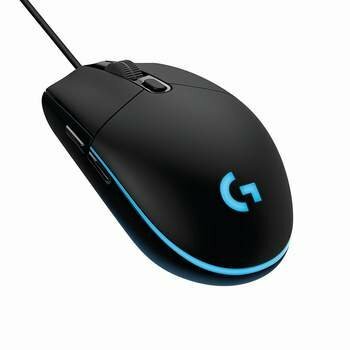 You don't need to be a gaming prodigy to dominate with the Logitech Prodigy Gaming Mouse. You just need to love gaming. The Prodigy is built with six programmable buttons and built-in memory so you can customize it to all of your favorite games - whether those be Skyrim, Starcraft, Battlefield, or Euro Truck Simulator 2. Customization doesn't stop there. The Prodigy can light up in 16.8 million different colors and can be tuned with an included 10g weight. Built with an advanced 200-8,000 DPI sensor and has a lightning-fast response speed up to 8x faster than most mice, you'll always be able to land your mark. Whether an amateur streamer or an eSports legend, the Prodigy is built for you.